Three letters is all that stands between fiction and non-fiction, but in practical and emotional terms, the gulf is immense. 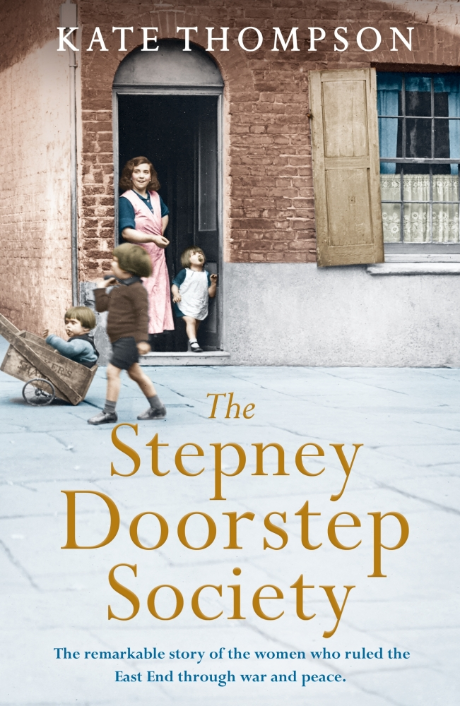 This year, after completing four novels, I made the leap across the divide when I wrote The Stepney Doorstep Society, a social history published by Penguin (Michael Joseph) in August. And what an extraordinary experience it has been. As a historical saga writer, like all my peers, I pride myself on accuracy, research and attention to detail, but the pressure has never felt too glaring. At the end of the day, it’s fiction. You can use some degree of creative licence, up to a point. But this time, for eight months, I lived and breathed a book which consumed most of my waking hours (and a good number of my unconscious ones too). 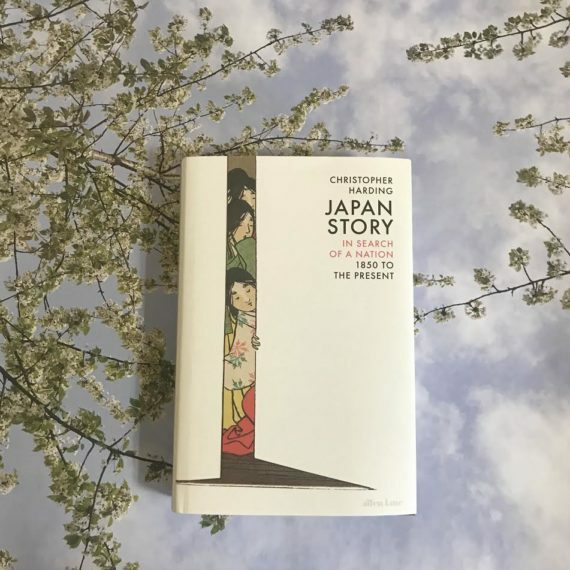 The Stepney Doorstep has been a labour of love, conceived over a lunch with an editor at Penguin, when I first mooted the idea of a book that had been swirling around in my mind for some time. In theory, it sounded easy–write a book based around the life stories of all the women I have interviewed as research. With every novel I’ve written, I’ve always including their stories at the back of the book. After all, true life is more extraordinary than anything you can make up. 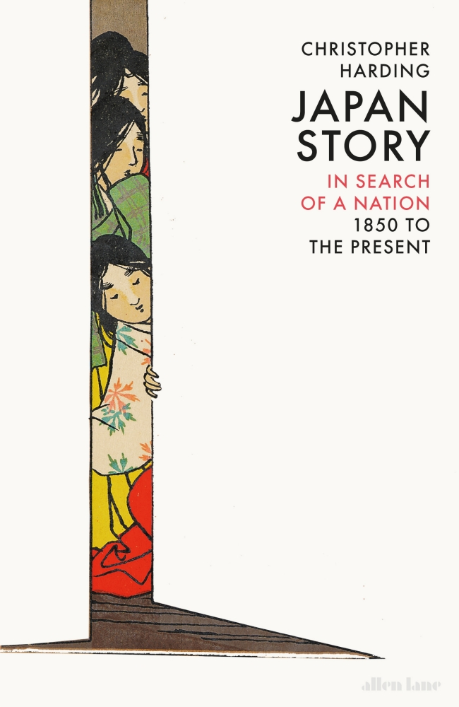 As readers contacted me to say: ‘I really like the book, but what I loved was the true life story,’ I began to see that I was doing these women – and my readers – an injustice by not featuring them more prominently. Over the past four years, I have pounded the pavements of the East End and beyond, sat in people’s front rooms, in community group lounges, bingo mornings, coffee groups and even tea dances, letting cups of tea grow cold as I listened, rapt, to some jaw-dropping, heartbreaking and fiercely funny tales. All the women I’ve met are robust characters who could’ve each filled a book in their own right. Now all I had to do was condense their stories into one book. Easy, right? The Stepney Doorstep Society is a fresh look at the Second World War seen through the lens of five formidable working-class women. 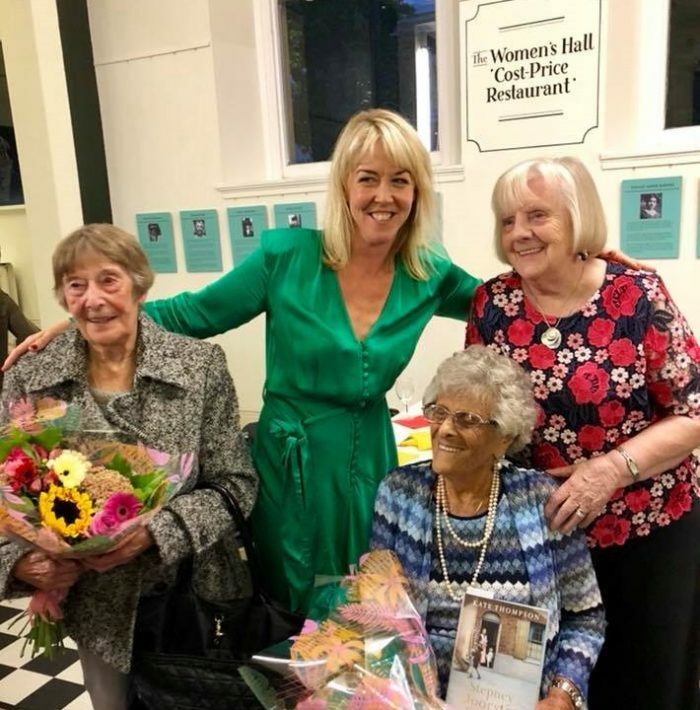 Doctor Joan Martin, 102, Beatty Orwell, 100, Minksy Keeper, 91, Babs Clark, 86, and Girl Walker, a sprightly 84, were all born into the first half of the 20th century. Their childhoods rolled out against a backdrop of brutal poverty, but immersed in vibrant, sharing communities. This book is written as an examination of the contribution of women to the rich social, economic and political history of East London in the days before the Welfare State existed. The East End, like all working-class communities, was a matriarchal society. Women in cross-over aprons and turbans were the beating heart of their neighbourhoods. The matriarch, or auntie, was the go to woman, responsible for birthing the babies of the street, laying out its dead and a plethora of other roles. As unofficial leader of her neighbourhood, she was social worker, midwife, citizens advice worker, funeral parlour, nurse, hairdresser, childminder, money-lender and abortionist, all rolled up in a starched apron. My five characters assume the main stage, but the voices and memories of other East Enders are dovetailed into the narrative to add extra richness and depth while expert opinions contextualize certain issues. At its heart, I wanted this to be a celebration of the women missing from the history books. This book tested me like no other. Research, fact-checking, signing contributors onto privacy release forms, clearing the material with 50 or so women (none of whom have email and many of whom preferred to have it read back face-to-face), finding relevant experts with something revealing to contribute who were willing to comment, clearing copyright for photos that date back decades, ploughing through wartime census records and trade directories ..When you write non-fiction, the devil is in the detail. Misspelling the name of a Jewish Kosher Butcher down a street market that was bulldozed in a slum clearance over 50 years ago – Ruborkin’s, in case you’re wondering – may not seem that big a deal, but you just know someone will gladly inform you if you’ve got it wrong. History matters. People’s personal history – from the shops they bartered in, to the hearthstone they used to whiten their steps ­– matters even more. Because big world events are so much more revealing when seen through the eyes of the woman on the street; that woman who held down three jobs whilst raising a massive family in two damp rooms, dodging bombs and sleeping on a drafty underground platform. Her story matters because she was a warrior in a wrap-over apron. The generation born before a Welfare State-protected society will not be around much longer to reminisce. This was brought home to me when two of the women in the book died while I was writing it – 102-year-old wartime medic Dr Joan Martin, and 101-year-old Millie Finger, who bravely faced down fascism and unimaginable poverty in the Jewish quarter during the Depression. Nearly 80 years on from the outbreak of World War Two, their stories reveal so much. I’ll be the first to admit this became an obsession! I nearly drove my poor editor/husband mad, but I hope it was all worth it. I think it was. At the launch at The Woman’s Hall in Stepney, I invited every single person I’d interviewed. Over 140 people turned up, mainly cockneys. We laughed and cried as we listened to stories, poetry recitals, songs and banter from a remarkable generation. There was an atmosphere of pure joy in the room. 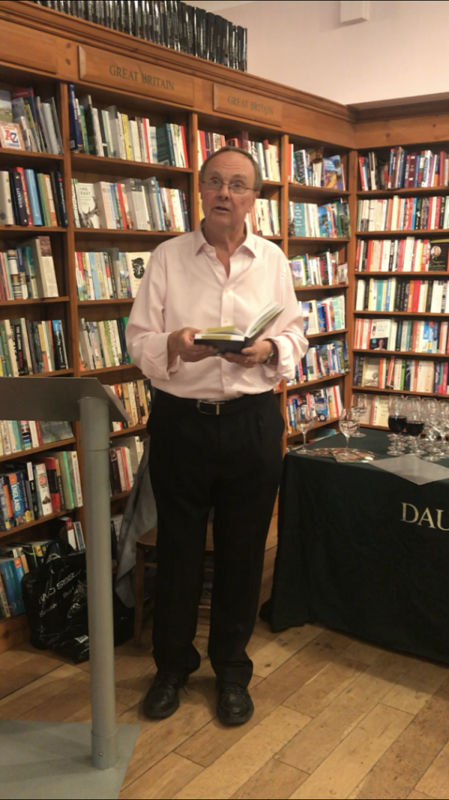 We sold out of books within half-an-hour, and my favourite moment was watching Ron, whose mum Flo used to rule her buildings in Bethnal Green with an iron fist, jokingly flogging his books at the back of the queue for twice the price. ‘Up here for thinking,’ he said, tapping his head, ‘down there for dancing.’ That’s pure cockney. And now, one month on from publication, I’m getting emails and letters that nearly always start the same way… This book reminds me of my beloved nan/mum... I’ve even received an email from a professor at a university in Washington DC, who was stunned to read the chapter on how women reacted to the Blitz. He has offered to put my name forward to speak at the Smithsonian Institution. These extraordinary working-class women and their tales have touched a nerve, and I hope they transport the reader back to a time and a place that was harder, but infinitely kinder. The Stepney Doorstep Society by Kate Thompson (Michael Joseph) is available now. A version of this article appears on the Romance Novelist’s Association blog.